Discussion in 'China & Asia Pacific' started by RMLOVER, Aug 30, 2017. HANGZHOU — A Chinese Academy of Sciences (CAS) research institute and Aliyun, Alibaba's cloud computing subsidiary, have released a cloud platform for quantum computing. The platform was announced online by Aliyun and the CAS innovative center for quantum information and quantum physics (Shanghai) at a cloud computing conference Wednesday in Hangzhou, East China's Zhejiang province, where Alibaba is based. The platform will offer users a development and testing environment for cloud-based quantum algorithms. Pan Jianwei, lead scientist of China's quantum experiments at space scale and a member of the academy, said the platform would help industrialize quantum computing. "If a classic computer is compared to a bicycle in computation speed, a quantum computer is like a jet," said Pan. Cooperation between CAS and Aliyun dates back to July 2015, when a quantum computing laboratory was launched. In May 2017, the world's first prototype quantum computer was developed by the laboratory and two Chinese universities. China is stepping up research and development of the Tianhe-3 supercomputer, which aims to be 10 times faster than the current world leader, as it strives to meet the country's growing needs for more accurate and efficient computing capabilities. The Tianhe-3 is designed as the world's first prototype exascale supercomputer, which means it can make a quintillion (1 followed by 18 zeros) calculations per second, and is intended to arm the country's manufacturers and government with greater speed, precision and scope for research. The supercomputer will be applied in such fields as the analysis of smog distribution, airplane designs, oil surveying and the development of artificial intelligence. 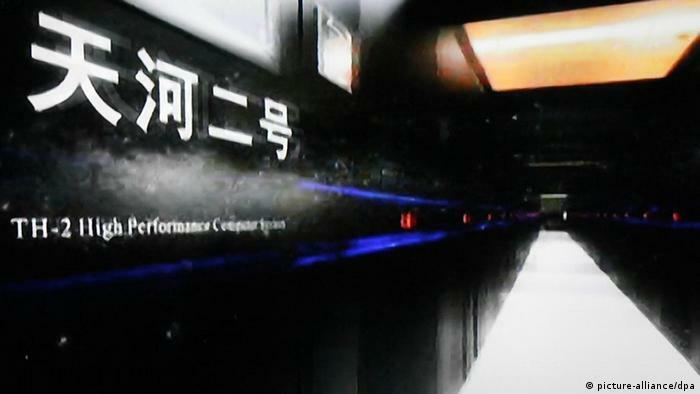 These functions overlap with the nation's existing supercomputers, such as the Sunway TaihuLight, which is currently the world's fastest supercomputer, with a peak speed of 125 quadrillion (1 followed by 15 zeros) calculations per second, said Meng Xiangfei, director of application at the National Supercomputer Center in Tianjin. "What sets the Tianhe-3 apart from the others is, for example, that it can help design more reliable aircraft by giving a view of its detail at a magnification of up to 10 times," Meng added. He explained that when forecasting weather on a national scale, the measuring range of the Tianhe-3 can be as accurate as 1 square kilometer. That would be five to 10 times more accurate than other supercomputers. "I think some weather forecasting applications in smartphones will become more accurate by the time the Tianhe-3 is fully functioning," said Meng, who confirmed the prototype is expected to be finished early next year and become fully operational by 2020. He said that the development of the Tianhe-3 differs from the Sunway TaihuLight in some quite significant ways. "To be specific, we are trying to make a 'supercell' which combines calculation, communication, big data and AI, which used to work separately. That is why the National Supercomputer Center in Tianjin has brought in a new batch of AI experts," said Meng. China is taking its computing power to the next level amid intensifying global competition in this field. The United States is working on an exascale supercomputer, but its prototype will not appear until 2023. Japan is building a machine that can make 130 quadrillion calculations per second, which could surpass Sunway TaihuLight. Wang Gang, an associate professor at the College of Computer Science and Technology of Jilin University, said China's supercomputers are chiefly used to assist scientific research, which need to process a huge amount of information within a short time span. "But as the Tianhe-3 improves AI capabilities, it will not only calculate faster but also smarter. It will therefore have greater potential in terms of commercial application," Wang said. Wang is working on a deep-learning project for autonomous driving. 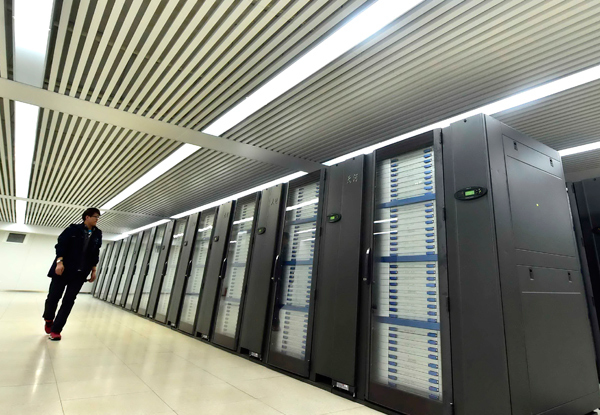 He has used the Sunway TaihuLight supercomputer to assist his research, and expects the Tianhe-3 to be more helpful. "China has an edge in hardware, but more efforts are needed to develop tailor-made software for supercomputers, in order to widen its application," Wang said. China QUESS quantum satellite is projected to have only a two-year lifespan transmitting quantum keys between China and Europe, it’ll be succeeded in 2030 by a constellation of quantum satellites. Yes, if you guys can manage to make this happen then you can build an exascale system around this. All the best. China already holds the two fastest supercomputers. Now it hopes to knock the USA off the third spot with the first ever exascale machine. Tianhe-3 will handle one quintillion calculations per second. Fast isn't the word. If China's Tianhe-3 supercomputer manages to hit the exascale mark, it will handle one quintillion calculations per second. Meng Xiangfei, a director at the National Supercomputer Center at Tianjin, told the China Daily newspaper that his institute aims to have a prototype of its Tianhe-3 ready by 2018. For that they will need breakthroughs in high-performance processors. But Meng is confident. If they succeed, Tianhe-3 will be 10 times faster than the current fastest supercomputer in the world, the Sunway TaihuLight. The Sunway runs at 93 petaFLOPS, with a reported peak speed of 125 quadrillion calculations per second. "Its computing power is on the next level," Meng told the newspaper. "It will help us tackle some of the world's toughest scientific challenges with greater speed, precision and scope." The Tianhe-3 will be measured in exaFLOPS. Its sibling, the Tianhe-2 runs at 34 petaFLOPS, while the USA's next best, Titan, creaks in at 18 peteFLOPS. If the Tianhe-3 breaks the peta-barrier, its processing speed will leave the rest for dead - which is probably a good thing as supercomputers don't have the longest life-expectancy. Super, but compared to what? How can we even begin to image the Tianhe-3's processing speeds? Well, one of the world's first computers (as we know them) was the Zuse Z3. It was a programmable, digital computer. Based on the same Boolean theory that gave us the zeros and ones of modern computing, the Z3 was the first solid implementation of so-called "flip-flops" and what became "floating point" arithmetic. A computer's processing speed is measured (in part) by the number of floating points it can handle per second - and that's why we refer to a FLOP or FLOPS. In 1941, the Z3's average single calculation speeds were 0.8 seconds for addition and 3 seconds for multiplication. Fast-forward 70 years or so and the average smartphone will perform addition and multiplication almost before we've finished entering the numbers…Imagine that, predictive math! Smartphones speeds tend to be measured in gigaflops (1 GFLOP = 1,000 000 000), but it's hard to get a good read on the latest models as the manufacturers are so competitive and as a result secretive. It is said, however, that Apple's A-series chips, which are made by Imagination Technologies, are years ahead of Qualcomm's Snapdragon chips, which Samsung and Google use in their phones. Gaming consoles are a lot faster than smartphones, but then again nothing compared to a supercomputer. It would take more than 18,000 Playstation 4s to match the Tianhe-2 - which, to remind us, is half as fast as China's Sunway supercomputer, and that is 10 times slower than the Tianhe-3 will be. Like I said, fast just isn't the word. But, then, the Tianhe-3 won't be a toy. Chinese scientists hope to use it to analyze smog distribution, gene sequence and protein structures to help develop new medicines. They also say it will simulate earthquakes and epidemic outbreaks in greater detail, "allowing swifter and more effective government responses." 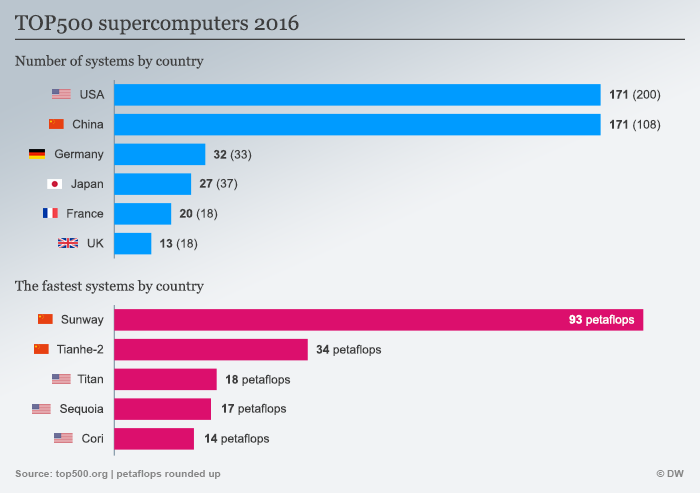 China already becomes the leader in supercomputer manufacturing in the world. Functionless builds. The US supercomputers are based on function. When you read the above facts, your mentality can not take it, and just make the jealous comments, what a shame! Nope, I say it because the US supercomputers are built to fulfil a function, whereas China are just experimenting to see what they can build. Look at the number of nodes the Chinese designs need. Unless you can split a problem into that many paths, the extra compute power isn't even useful. The building blocks just aren't there. Sure, they can put lots and lots of crappy CPUs together to get something with more FLOPS, but the base level technology isn't there. From power consuming point of view, the running cost will be higher, but it does not mean it is not useful. The Earth System Science Research Center of Tsinghua University cooperated with the Department of Computer Science to realize the numerical simulation of Earth system with millions of nuclear scale and high resolution for the first time by using the "Shenwei · TaihuLight". Earlier, the earth simulation system model in mainland China only reached a resolution of 200 km on a grid scale. However, it is now possible to carry out a simulation of the Earth system with a grid resolution of 25 km at a resolution of 10 km at sea. At present, more than 30 user units have cooperated with the State Supercenter Wuxi Center in the fields of weather, aerospace, marine science, new drug creation, advanced manufacturing and new materials . The 2016 Gordon Bell Award for "Global Atmosphere Non-Static Cloud Resolution Simulation" application on the Superconductor of Sunway Taihu Light Supercomputer was awarded to the Design Award for Application Software on Supercomputer because of the effective performance of hardware Ultimately depends on the software design, the previous 30 years the prize was obtained by the United States and Japan, for the first time a third country to break this rule.